The KL1104 and KL1114 digital input terminals acquire the binary control signals from the process level and transmit them, in an electrically isolated form, to the higher-level automation unit. The KL1104 and KL1114 versions have input filters of different speeds. The Bus Terminals contain four channels that indicate their signal state by means of light emitting diodes. 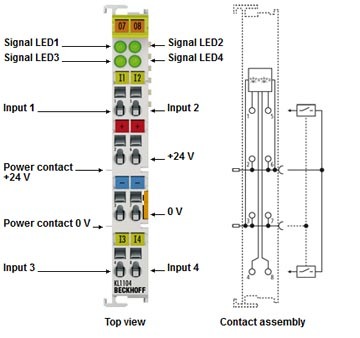 The KL1104 and KL1114 are particularly useful for space-saving use in control cabinets. The Beckhoff KL1104 digital input terminal acquires the binary control signals from the process level and transmits them, in an electrically isolated form, to the higher-level automation unit. The Bus Terminal contains four channels that indicate their signal state by means of light emitting diodes.